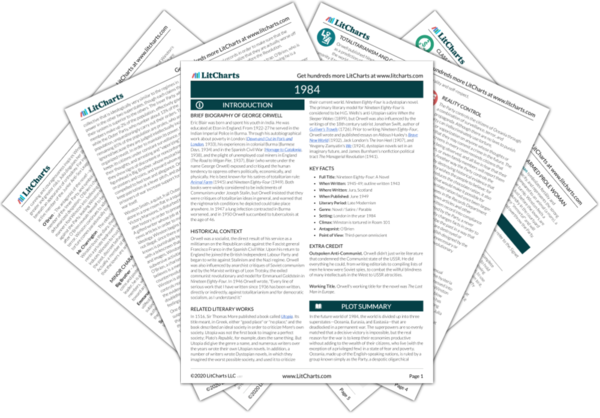 Instant downloads of all 946 LitChart PDFs (including 1984). LitCharts assigns a color and icon to each theme in 1984, which you can use to track the themes throughout the work. Winston wakes from a dream of his mother, who was vaporized when he was a boy, not long after his father disappeared. He sees his mother, holding his baby sister in her arms, on a sinking ship, looking up at him through the water. He knows that his mother sacrificed her life for him and he regrets that there is no longer any privacy, love, friendship, or complex emotions—only fear, hatred, and pain. Winston experiences considerable guilt over his treatment of his mother prior to her disappearance. His mother represents the old world, when emotional ties, particularly between family members, were valued and respected. Still dreaming, he finds himself in a pasture in the countryside that he thinks of as the "Golden Country." The girl with dark hair comes toward him, taking off her clothes with a careless gesture that Winston admires. He awakens with the word "Shakespeare" on his lips to an ear-splitting whistle from the telescreen, the daily wake-up call for office workers. The ease with which Julia defies the Party's rules impresses Winston, who finds it harder to repudiate them because he must do so on an intellectual level. Struggling through compulsory morning exercises, Winston tries to remember a time when Oceania hasn't been at war, and fails. Instead, he remembers sheltering as a child with his family in a Tube station during an air raid with a drunken old man who kept repeating that they "didn't ought to 'ave trusted the buggers." Because the written record is perpetually changing, and people are not allowed to speak of any version of events other than the official one, it is impossible to keep track, but Winston seems to remember that though the country has always been at war, the enemy has changed. According to the Party, however, Oceania has always been at war with Eurasia and allied with Eastasia. Winston knows that to remember differently constitutes thoughtcrime. The Party controls the citizens of Oceania by altering the historical record so that it reflects whatever views the Party finds it in its interest to promote. Winston constantly struggles to negotiate the discrepancy between the evidence of his senses and what the Party wishes him to believe. The old man represents the people who initially supported the Revolution and who were later betrayed by Party leaders whose desire for power led them to abandon their political ideals. Winston decides that the Party's ability to change the past by controlling not only the media, but also the minds of citizens, is it's most frightening power. He focuses on the concept of doublethink, a Newspeak word meaning "reality control," the ability to believe simultaneously in contradictory opinions when it's ideologically convenient. Winston tries to remember the year he first heard of Big Brother and realizes that the past has been destroyed, not merely altered. He does not even remember when he first heard the word INGSOC—Newspeak for the movement formerly known as English Socialism. Reality control was an important feature of 20th century totalitarian regimes such as Nazism and Stalinism. Propaganda was a powerful tool, as was surveillance, and when individuals appeared resistant to ideology they were often "persuaded" through torture. Winston's dreams, memories, and diary entries all challenge the view of history the Party wishes to promote. At that moment the telescreen screams at him to pay attention, and Winston realizes that his facial expressions are betraying his loathing of the Party. Winston is shocked into the realization that he is under constant surveillance, and is therefore in great danger. Celona, Tina. "1984 Book 1, Chapter 3." LitCharts. LitCharts LLC, 22 Jul 2013. Web. 4 Nov 2018. Celona, Tina. "1984 Book 1, Chapter 3." LitCharts LLC, July 22, 2013. Retrieved November 4, 2018. https://www.litcharts.com/lit/1984/book-1-chapter-3.